The God Complex is a perfect swan song for Amy Pond, not only for trailing her most harrowing experience in The Girl Who Waited, but by putting her childlike faith in the Doctor finally to rest. It does this in a simple but effective story about a beast who feeds off corrupted faith in a haunted hotel, and like the story that precedes it is one of the best of the season. 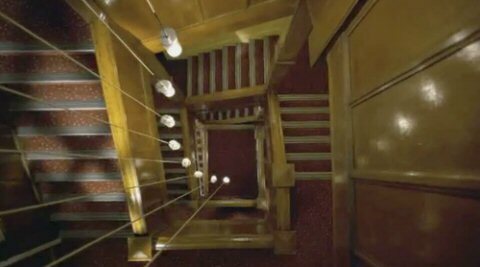 The hotel is a glaring homage to The Shining, with clashing decor, endless hallways, and staircases shot Vertigo-style. There's even a clown in one of the rooms, posturing deliberately out of Kubrick's film. The concept of this building is bloody fantastic, a playhouse of horrors where each room contains the worst fears of one individual, that when confronted causes insanity and a sudden perverse devotion to the minotaur who stalks the corridors like a psycho out of a B-slasher. It's also an active maze, meaning the halls randomly shift, which conveniently foils the Doctor's rescue of the hotel prisoners when his TARDIS becomes lost -- we've seen this sort of device used before in The Impossible Planet/Satan Pit and 42. The hotel is in fact the true antagonist of the story, rather than the minotaur itself, but a 45-minute episode doesn't really allow its full potential to be unleashed. The minotaur works fairly well, if a bit cheesy, and it's a nice touch that it's related to the Nimon of the Tom Baker years. Since the beast succeeds by perverting faith, his captives must have some belief system to begin with. That lets Rory off the hook, but not Amy, who of course still believes in the Doctor in her innocent Amelia-like way, despite all the hell he's put her through the past two seasons, and also the way her trust in him has already been somewhat crushed in stories like Amy's Choice. When she and the Doctor see what's inside her room, the Doctor proceeds at once to destroy her faith in him, which not only saves her from the beast but severs its food supply and gives it space to die (a resolution that requires we don't look too closely). His demolishing of her faith is the crux of the story, and many critics have drawn the parallel to The Curse of Fenric, where the Doctor's victory also depended on shattering the faith of his companion. The difference is that the Seventh Doctor relied on psychological bullying to tear Ace down, while the Eleventh builds Amy up more positively, significantly by admitting she was right from the beginning: "I'm not a hero, just a madman in a box". While I honestly prefer McCoy's mean-spirited strategy, Smith's acting here is quite good, conveying impressions that he is weighed down by the way he uses human companions to assuage his loneliness and have inferiors around to "worship" him and feed his ego. As for what's inside the Doctor's room (appropriately #11), it's a cop-out that we don't get to see what so horrifies him, though it's not hard to guess. The ring of the cloister bell is a TARDIS tip-off, perhaps pointing to the Doctor's eternal fear of losing it, without which he would be near powerless, and for that matter there would hardly be any Doctor Who. Amusingly, this could almost stand as a meta-fear of the audience; what else is the greatest terror of any Who-fan? Meanwhile the guest actors do well for their parts and allow us to ride the thrill of more traditional horrors. The weeping angels make an unexpected appearance, and we initially assume they are for Amy given the terror she endured in Time of the Angels/Flesh and Stone. There's a gorilla for the prologue victim that's a bit on the embarrassing side, but the ventriloquist dummies that laugh maniacally are downright chilling. The epilogue is simply beautiful. Even if this is the new series, where farewells are preordained cop-outs -- it's a sure bet that Amy and Rory will be back at some point, for the finale at least -- I haven't seen a companion departure so moving since Sarah Jane Smith in The Hand of Fear. Sarah's exit set the standard by which all other companion departures are judged. The only one who came close to topping it, fittingly, was Toby Whithouse in School Reunion, with a second farewell to Sarah decades after her return. Fans might object to me ranking these above the departure of Rose Tyler, and part of me agrees; Doomsday is an unrivaled tear-jerker. But I ultimately put Rose in a class by herself on account of the exceptional (if unrealized) romance between her and the Doctor. Amy's farewell, like Sarah's in the '70s, delivers so much in simple gestures and looks that speak volumes. 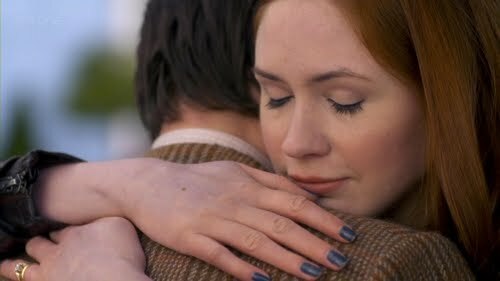 There's a real feel in the closing scene that the Doctor and Amy have have become best friends and find it enormously painful to part company. 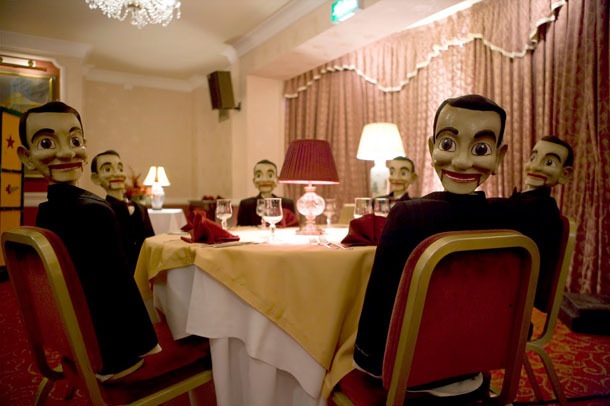 In sum, The God Complex is a terrific episode that falls short of the highest greatness only for a slightly cheesy creature and the feeling that a diabolical monstrosity like the hotel fits within a wider context of something larger than a story on its own right. Great review. Pretty much agree!